Embroidery embellishes this graceful sweater. Decrease lines radiating from the neck edge draw attention to your face despite the high neckline in front, and sleeves that flow out from the yoke look great pulled all the way down or cinched up. This sweater is worked in the round from the bottom up to the deep V neckline in the back, then it’s worked flat. To be worn with 0” ease. Shown in Size S (34”) on model with 35” bust. Knit Picks “Wool of the Andes Sport” 100% Peruvian Highland Wool. 137 yds per 50 g skein. Shown in MC: Cobblestone Heather, 6 (7, 8, 9, 10) 11, 12, 13, 14 skeins; and CC embroidery: Papaya Heather, approx 5 yds. 24 sts & 28 rows = 4” in St st, blocked. 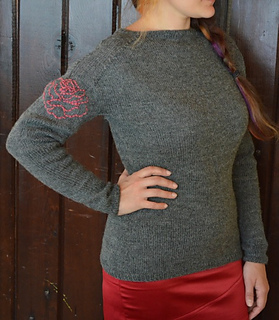 This sweater is worked in the round from the bottom up to the deep V neckline in the back. After this point it’s worked flat. The embroidery requires less than 5 yards of yarn; this is a great opportunity for using left over pieces of yarn!